Attorney General Jeff Sessions was a prominent Trump campaign surrogate when he met with a top Russian diplomat. During Trump rallies, Flynn, right, would lead the crowd in “Lock her up” chants. After 24 days in office Flynn has resigned over a likely violation of the Logan Act. In a pre-Superbowl interview with Bill O’Reilly, President Trump defended Vladimir Putin’s kills. Trump may never have met Putin, but his Secretary of State, ExxonMobil CEO Rex Tillerson, has received an Order of Friendship from him. Hillary Clinton supports Syrian insurgents, many of whom are linked to known terror groups, over the Russian-backed Bashar al-Assad regime. ISIS soldiers march in Raqqa, Syria, the terrorist organization’s de facto capital. San Bernardino shooting suspects, Tashfeen Malik and Syed Farook. Right-wing extremism received heavy scrutiny for a few days following the Planned Parenthood attacks. Commentators and left-wing politicians criticized the venomous rhetoric the right uses to denounce its opponents, one of which – the red herring cry of “baby parts” – was used by the Planned Parenthood shooter himself. Since the San Bernardino shooting, committed by Muslims a few days later, white terror has largely fallen off the radar. It shouldn’t. On Friday, November 13, the city of Paris was laid siege by a small band of terrorists from the Islamic State who raided a theater, a concert hall, a soccer stadium and other venues using AK-47s and suicide bombs to. No final tally has been released and many victims remain hospitalized, but at least 129 are known to have died. In terms of death toll, it’s the worst attack in France since World War II. In addition to the French massacre, ISIL is responsible for downing a Russian airplane carrying 224 tourists to Egypt. The day before the Paris attack ISIL detonated bombs in Beirut, Lebanon, claiming dozens more lives. These attacks are in addition to many smaller ones, the group’s destruction of culture, and the atrocities committed against women, hostages and apostates in ISIL-controlled territory. 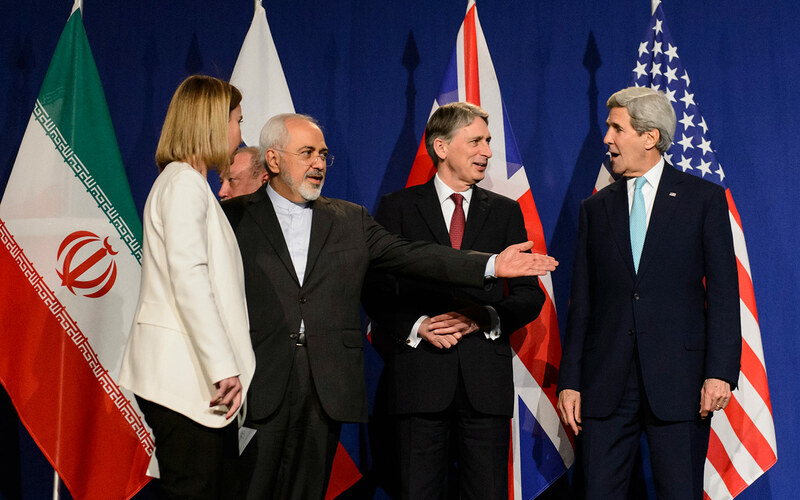 Iranian Foreign Minister Mohammad Javad Zarif, second-left, stands on stage with diplomats in Switzerland, including US Secretary of State John Kerry, far right. As diplomats from the US, UK, Russia, China, France and Germany move closer to reaching a historic deal with Iran that would temporarily block it from pursuing certain nuclear ambitions in exchange for relaxation of sanctions, Republicans are vowing to do all they can to scuttle the deal. It’s remarkable that, at a time when the first modern meaningful international agreement between the US and Iran is about to go through, Republicans are rattling sabers as aggressively as ever. Wisconsin governor and Republican presidential candidate Scott Walker called the deal “one of America’s worst diplomatic failures.” “Instead of making the world safer,” Walker alleges, “this deal will likely lead to a nuclear arms race in the world’s most dangerous region.” In keeping with the lockstep obstructionism that has defined the GOP throughout Obama’s presidency, other Republicans have protested the deal, citing Iran’s untrustworthiness and existential threat to world peace. For years, Washington and the news media have portrayed Iran as the most dangerous national power on the planet. That opinion is not widely shared by the global community, however, which by a significant margin places the United States at the top of a list of the biggest threats to world peace. Despite the abundance of negative public opinion on Iran in the US, the question of what exactly makes the country such a threat is rarely meaningfully explored.